Looking to expand your impact with groups and teams as a coach? We are a one-stop shop for all things groups and teams. From Books, to ICF- approved CCE programs to audio and print resources, we hope you'll enjoy your visit! Welcome to Group Coaching Essentials with Jennifer Britton. This is our 2018/19 refresh. This website is dedicated to tools, resources and programs for coaches and other professionals wanting to expand their work to teams and groups, particularly in the area of Group Coaching and Group Programs. We have offered Group Coaching training since 2006. ​This is the site of author and coach Jennifer Britton, author of Effective Group Coaching and From One to Many: Best Practices of Team and Group Coaching (Jossey-Bass, 2013). You will find information here regarding Group Coaching Essentials (accredited for 8.75 ICF CCEs), the Advanced Group Coaching program (10 CCEs with the ICF), Workshop and Retreat Essentials , the 90 Day BizSuccess program for Coaches, and the Group Program Virtual Retreat Day. The site also includes information about our in-person training programs including the Group and Team Coaching Intensive (2 days/19 CCEs) and the Facilitation Skills Intensive (2 days). As we move into 2019, these are more commonly offered as in-house programs. Known as a "Coaches Coach" Jennifer also provides individual and group mentor coaching for those working towards their ICF Credentials (ACC and PCC), as well as their Certified Professional Co-Active Coach (CPCC). You can find information about individual mentor coaching, as well as our Mentor Coaching Group (10 hour combination of group mentor coaching (7hrs) and 3 hours of individual mentor coaching). Jennifer also offers individual mentoring services for those building their own coaching business or those creating their own group and virtual programs (our Virtual Individual Mentoring VIP Days). In addition, you will find information on many of the programs we offer to the public including Your Balanced Life TM, the 90 Days Biz Success program (for business owners), and retreats (virtual and in person for individuals, couples and organizations). We hope that you enjoy visiting our site, as well as our award winning blogs (The Biz Toolkit and the Group Coaching Ins and Outs blog). Most programs are led by Jennifer Britton, PCC, CPCC, CHRP, CPT, who founded Potentials Realized in 2004. Potentials Realized is a Canadian-based performance Improvement company, dedicated to working with organizations and professionals around the world who are keen to deliver extraordinary work and impact. We are known for our work in the areas of group coaching, mentoring, leadership development and high impact, experiential learning. Jennifer is the author of Effective Group Coaching (Wiley, January 2010), the first book to be published on the topic of group coaching globally. Her 2013 book expands the focus to Coaching Many - From One to Many: Best Practices for Team and Group Coaching (Jossey-Bass, 2013).Her 2017 follow up, Effective Virtual Conversations, widens the focus to the virtual space. One of Potentials Realized's core offerings is the Group Coaching EssentialsTM program, designed to support coaches in designing and marketing their own group coaching programs for clients. Offered since 2006, this program has benefited hundreds of coaches globally. Please note that the Group Coaching EssentialsTM program is eligible for CCE's (Continuing Coach Education) Units from the International Coach Federation (8.75 CCEs). Some coaches go on to complete the Advanced Group Coaching Practicum, also approved for CCEs (10 CCEs), designed to provide coaches with more practice and feedback on their skills in group coaching. Jennifer also offers two annual programs - The Learning Lab and Design Studio (LLDS) Group focuses on all things groups and teams. Geared to support coaches, trainers and facilitators who want to expand their group and team programming skills, as well as boost their business. The LLDS is a resource rich portal, and community of exceptional practitioners, who meet for two group coaching calls on topics related to group and team programming (workshops, retreats, teleclasses) as well as one Facilitation Lab per month. In the Facilitation Lab members get the chance to experience a different facilitation tool each month. Members also have access to a wide variety of articles, posts, audios and videos from Jenn. Click here to learn more about this six and twelve month support. The Coaching Biz Growth Lab supports coaches with their coaching business development. This group meets on Fridays during the 1st and 3rd weeks of the month (3 - 4 pm Eastern). This group supports coaches who want to move the needle on their business. 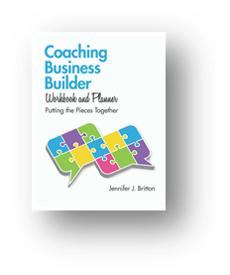 Jennifer incorporates a variety of business coaching tools and resources, including her 2018 book - Coaching Business Builder Workbook and Planner. Jennifer is committed to providing resource rich tools for practitioners - coaches, facilitators, leaders and other professionals - who are leading group programs (workshops, retreats and group coaching). E-products include the Group Program Toolkit (33 Templates you can adapt for your programs), the Engaging Exercises for Teams and Groups E-manual, and the 40 Ways to Work with Visual Cards. We bring a solid track-record of working with organizations, groups and individuals across North America, Europe and the Caribbean, on issues including team building, business development, marketing and leadership development. We have created and delivered programs for governmental agencies, community groups, professional associations, corporations and the non-profit sector. Programs have ranged from the development of succession planning programs, to talent management and virtual team issues, to support for mentoring programs, using a coaching approach. We have designed programs for financial services, pharmaceutical, governmental, transportation, health care, and natural resource sectors. We have designed award winning Mentor Training programs for the Financial Services Sector. Our clients have included UNICEF, Cooperators Insurance, Ontario Provincial Police, Community Care Access Center, and the Toronto CFA Society. For more information about our other services, please visit www.potentialsrealized.com. We offer a range of programs in many different formats (Webinars, teleseminars, in-person workshops; individual, team and group coaching; in person and virtual retreats). We develop customized solutions for organizations and groups, across facilitation, training, performance, leadership development and succession management issues. For more information on any of our programs or services, please contact Jennifer direct at (416) 996-TEAM (8326)or at info@potentialsrealized.com. We would be pleased to speak with you about your needs, and develop with you a customized solution. We look forward to hearing from you! Mentor Coaching Group - Fridays 1130 - 1230 pm ET Eastern (by Zoom) - end of March to end of June. Summer group starts mid-July.